You won’t see the early life stages of asparagus miners. Whitish eggs are only 1/1000” in diameter and laid under the epidermis, at the base of asparagus stalks. Slightly larger larvae (15/1000”) are also white and tapered at both ends, with black mouth hooks. After feeding, they will grow to 1/5” in length before pupating. Pupae are dark brown and flattened and can be up to 17/100” long. These pests overwinter in the pupal stage, either in the soil or in stalks. Adult flies are small (1/10”), shiny black and somewhat humpbacked. They have clear, tapered wings. In California, they appear in May and again near the end of the summer. 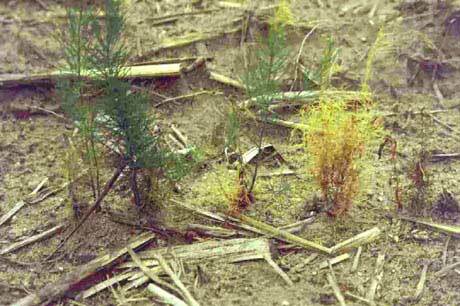 Damage is usually seen during the fern growth stage. As they feed, asparagus miners burrow a meandering pattern just below the surface. This feeding behavior can result in girdling, which causes chlorosis. More often, the damage is mostly cosmetic. The real problem associated with asparagus miners is that they are vectors for Fusarium root and crown rot. If you see bright yellow discoloration or wilting in your asparagus plants, it may be that asparagus miners have brought Fusarium root and crown rot to your asparagus bed. In that case, both the affected plant and the surrounding soil should be removed and thrown in the trash. Generally, parasitic wasps keep asparagus miners in check. If a heavy infestation occurs, remove the fern growth at the end of its season and throw it in the trash. Insecticides are not effective. Cardboard and newspaper have long been touted as excellent tools to block weeds, protect raised beds, and in sheet mulching. It is true that cardboard and newspaper block weeds. What we have found is that cardboard and newspaper do not always breakdown the way we expect. Without sufficient moisture, cardboard and newspaper can create durable barriers that attract a couple of serious pests. It ends up that termites and voles love cardboard. By putting a layer of cardboard under your raised beds, you are putting out the vole and termite welcome mat. If you have voles, forget the cardboard and use sturdy hardware cloth instead. The use of cardboard and newspaper in sheet mulching restricts water and gas exchanges. This means nearby plants have a harder time getting the air and water they need. Depending on the soil structure and other conditions, the soil may become so dry that it is hydrophobic, leaving installed plants to die of thirst and weeds around the edges of the cardboard to enjoy the runoff it creates. Cardboard and newspaper can also slow evaporation and aeration, setting the stage for fungal disease and root rots. Newspaper, if kept moist, will break down. If it is not kept moist, it becomes a barrier. Sheet mulching only works successfully as a temporary weed control measure. Long term use of newspaper or cardboard actually creates more problems than it prevents. What to do if the cardboard is already in place? If you already have cardboard and newspaper in place, inspect it for signs of termites and voles. If signs of either are visible, remove it completely, bag it, and throw it in the trash. Then, inspect the soil underneath for signs of life. If the sublayer looks like hardpan or mud, you will need to treat it accordingly. Hardpan layers need organic material. Mud needs to dry out. Unless roots have grown into the cardboard layer, it is better to remove it completely. If it cannot be removed, poke holes in it and water it until it decomposes. Once you have corrected the problem, cover the area with a healthy layer of coarse wood chips and let it go fallow for a while. The wood chips will reduce weeds while feeding important soil microorganisms. Cardboard still makes an excellent brassica collar or earwig trap. Beyond that, send it to the recycling center.